ISOFLEX has taken WPI technology to a whole new level of measurable superiority. ISOFLEX is significantly lower in lactose, fat, sugar and carbs, compared to regular WPIs. If you’re looking for the highest quality, most premium and fastest absorbing protein, then look no further than ISOFLEX; a Truly Superior Whey Protein Isolate. In just about every way a protein can be, ISOFLEX is Truly Superior. ISOFLEX® employs a unique protein extraction technology called HRI. A hybrid of two isolate purification technologies incorporated at a specific ratio to produce a truly superior ultra-pure Whey Protein Isolate. 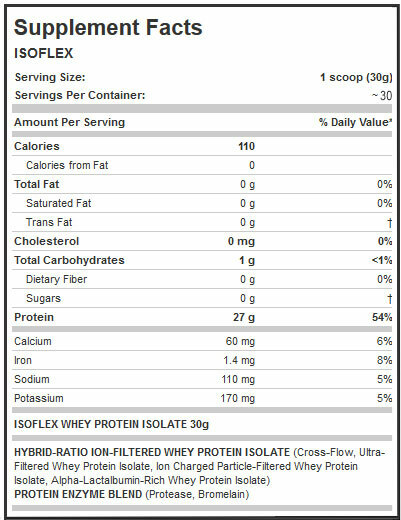 Cutting-Edge Hybrid-Ratio Ion-Filtration (HRI) Technology allows ISOFLEX to retain an exceptionally high protein yield while maintaining enhanced bioactive whey fractions (chart below). ISOFLEX contains absolutely NO Whey Concentrate. Concentrates have higher levels of fat and sugars with a lower percentage of protein and lower bioavailability than Isolates. While other brands use Concentrates, ISOFLEX users know that Isolates have a superior protein percentage and won’t settle for non-Isolate blends. Together we can put an end to the scourge of Scoop Loss. Gone are the days of digging through your protein to get your scoop. 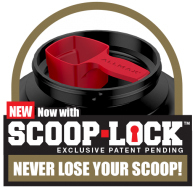 SCOOP-LOCK is ergonomically designed to lock your scoop into place the first time and every time! And it’s right there at the top of your ISOFLEX when you open it! Scoop-Lock is available on all ISOFLEX, ALLWHEY Gold, ALLWHEY Classic and HEXAPRO products and it’s only from ALLMAX. Look for the rugged new Ergo-Lid™ on ALLMAX products with Scoop-Lock™ inside! Every ingredient added and every lot produced is laboratory-tested for purity and potency to ensure consistent product quality and integrity every time, guaranteed. 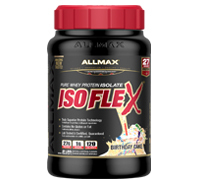 ISOFLEX® goes through the exclusive ALLMAX 5-Stage Quality Testing protocol. 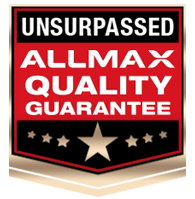 In fact, we’re so confident in the quality of our product that it’s completely guaranteed. Test our product; we guarantee it passes every time or we pay for your testing and refund your purchase. You won’t find anyone else willing to stand behind their product with this guarantee. Directions: Combine 1 scoop (30 grams) of ISOFLEX protein powder with 1/2 cup, or 120 ml of water, juice or milk (most choose water or skim milk), depending on your preference, at any time during the day that you need a protein boost. Most athletes with elevated protein requirements double each serving with 2 scoops of ISOFLEX with 1 cup, or 240 ml water, providing 60 grams of protein. Most bodybuilders are aware that high levels of protein consumption are critical to their success. Most will aim for 1.5 to 2 grams of protein per pound of bodyweight daily and space their consumption throughout the day. ISOFLEX mixes well in a shaker cup but can be combined with other ingredients in a blender as a smoothie as well. i. In the morning – when you sleep, your body goes without food for six or more hours putting you in a state of catabolism. To shift your body into an anabolic state (which is essential to increase lean muscle mass) consume a protein shake with 1-2 scoops of ISOFLEX or add a couple scoops of ISOFLEX to a hearty bowl of oatmeal. ii. Pre-Workout – by consuming a protein shake with 1-2 scoops of ISOFLEX approximately 30 minutes prior to training you can maximize protein synthesis and prevent catabolism. iii. Post-Workout – as soon as you’ve dropped your final set your next step should be to consume an ISOFLEX protein shake with some fast-acting carbs (2-3 rice cakes are a quick and easy option). This will boost protein synthesis and prevent muscle breakdown. A second option popular with bodybuilders is KRUSH LOADED immediately after working out, then 30 minutes later, ISOFLEX protein powder. ISOFLEX has been tested by an Independent, 3rd Party Laboratory for Banned Substances. Product is randomly selected from retail outlets and test result details can be viewed at informed-choice.org.